Israel is bombing Hamas’ tunnels: Lower Gaza shouldn’t be allowed to hold Upper Gaza hostage. Lower Gaza is holding Upper Gaza hostage. It’s time to end the ordeal. An Israeli army officer on July 25, 2014 during an army-organized tour for journalists in a tunnel said to be used by Palestinian militants from Gaza for cross-border attacks. On July 26, for a magical 12 hours, Hamas and the Israel Defense Forces honored a cease-fire in Gaza. The IDF continued to destroy Hamas military tunnels and found four new shafts during the lull. Yet, according to media reports on both sides, no civilians were killed. That paradox suggests a way to dial down the war. Israel says its immediate mission is to destroy the tunnels. It wants to preserve that mission in any cease-fire. Hamas rejects that demand, insisting that the IDF leave Gaza. But Gaza, more so than any other place on Earth, is arguably two territories: one on the surface, one below ground. That difference in elevation separates the terrorists from the civilians more effectively than any line on a map. To stop the killing in Gaza and the rocket fire on Israel, we need a way to isolate Hamas from its Palestinian hostages. For three weeks, we’ve seen how horribly difficult it is to do that on an urban grid. Maybe it’s time to consider a different dimension. Hamas began digging tunnels about 25 years ago. Through tunnels from Egypt, it smuggles in goods and weapons. Below Gaza’s urban centers, it stores rockets and bombs, operates hidden launchers, and shields its commanders from Israeli fire. Through tunnels to Israel, most recently on Monday, it stages kidnappings and military attacks. The tunnels form another world. Some are 20 feet below the surface. Others go down 90 feet. Many are elaborate, with power cables, phone lines, sewage pipes, oxygen supplies, or even rail tracks. The IDF calls this world “Lower Gaza,” an “underground terrorist city.” It’s why so few Hamas commanders have perished in Israel’s air strikes. They were in their bunkers, safely below the graves of the innocents who died. You won’t find civilians in Lower Gaza. Upper Gaza’s former health minister, a Hamas man, says people who live above the tunnels don’t even know what’s beneath them. When Hamas does inform a property “owner” that something’s going on under his land, it doesn’t disclose the location. It tells him that his dominion extends only to the surface. Lower Gaza, like Upper Gaza, can be divided into regions. 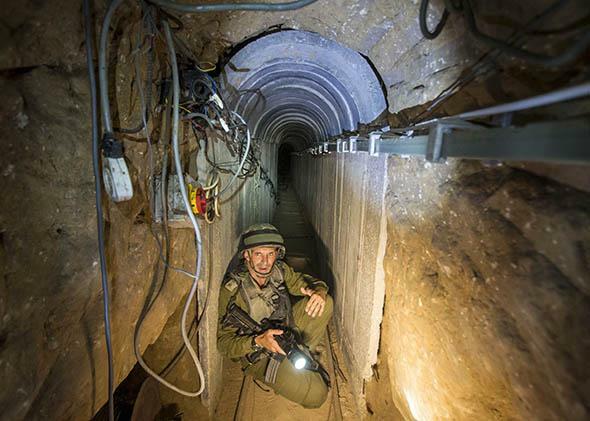 The tunnels that alarm Israel most are the ones that burrow into its territory. These start near the Israeli border, not in the middle of Gaza. From east to west, Gaza’s width ranges from three to six miles. So far, the longest tunnel to Israel that’s been found extends one mile. These factors raise an intriguing possibility: Could the tunnels to Israel be destroyed without going deeper into Gaza, and without killing civilians? You can’t do that from the air. That’s one clear lesson from the early days of this war. But now that Israeli troops are in Gaza, it’s easier to target the Hamas netherworld. The IDF claims to have located more than 30 tunnels and destroyed about one-half of them. There might be another 30 or so left to find. That’s a bit too rosy. It doesn’t square with the “human shield” pictures broadcast by Israel’s PR people, which depict tunnels near mosques, hospitals, and residential areas. The IDF says it has found tunnel entrances in kitchens and bedrooms. To carry out its searches, it has raided neighborhoods, drawing fire from Hamas. The worst incident was in Shejaia—supposedly the “capital” of Lower Gaza—where a brutal artillery exchange destroyed 10 buildings and killed more than 30 women and children. One possible compromise might be a cease-fire that forbids further IDF movement in Upper Gaza but allows the IDF to continue demolishing Lower Gaza. No more tunnel hunting on the surface, but you can finish imploding the bunkers and passages you’ve already found. Both armies would object, but civilians on each side would be protected. If Hamas refused the deal, the IDF would keep moving through Upper Gaza to hit Lower Gaza. Israel would have to be held accountable, to make sure it respects the distinction and pulls out expeditiously. In the longer term, each side needs more. Gazans need reconstruction aid, open borders, and autonomy. Israelis need an end to rocket attacks. All of these goals could be served by destroying the tunnels and weakening Hamas. It was the discovery of an attack tunnel that drove Israel to tighten its blockade on Gaza last fall. Cripple the threat from below, and Israel might loosen its grip. That outcome could be written into a truce agreement and enforced by arm-twisting from the United States. For eight years, Lower Gaza has held Upper Gaza hostage. It’s time to end the ordeal.